Zigbee is a wireless network used for home, building and industrial control. It conforms to the IEEE 802.15.4 wireless standard for low data rate networks. With a maximum speed of 250 Kbps at 2.4 GHz, ZigBee is slower than Wi-Fi and Bluetooth, but is designed for low power so that batteries can last for months and years. The typical ZigBee transmission range is roughly 50 meters, but that can vary greatly depending on temperature, humidity and air quality. Although ZigBee networks can be configured in star, peer-to-peer and mesh topologies, it is the mesh network from which ZigBee was named. A ZigBee mesh provides multiple pathways from device to device (like the Internet) and eliminates a single point of failure. If nodes go down or are removed, ZigBee devices can "zig" and "zag" through the network to their destination like a bumblebee. ZigBee networks are simple control networks that periodically send small packets from sensors to regulate lights, motors and other equipment. A large building can have tens of thousands of ZigBee nodes; a home could have a hundred or more. According to the GSMA, the number of total wireless connected devices is expected to more than double from 9 billion today to more than 24 billion in 2020. That growth will be paced by strong momentum in mobile connected devices which are expected to increase from 6 billion today to 12 billion by 2020. 6LOWPAN - IP Version 6 over the low power area networks. The target for IP networking for low-power radio communication are the applications that need wireless internet connectivity at lower data rates for devices with very limited form factor. IPv6 is also in use on the Smart Grid enabling smart meters and other devices to build a micro mesh network before sending the data back to the billing system using the IPv6 backbone. Energy Harvesting - (Also known as Energy Scavenging) technology that can capture and store energy from external sources like the sun and movement — instead of using costly batteries that have a limited lifetime to power the sensors, the vibrations emitted from the machinery also power them. Possible energy sources include solar, vibration, air flow, and hybrid. ZigBee Alliance is developing a standard for devices that use energy harvesting to capture and store power. In many applications, energy harvesting will be exploited to run devices when they can, but will then store excess energy for later use. For example, most ambient energy harvesting transducers do not provide adequate peak power or the power reliability needed to perpetually power micro-electronic applications requiring autonomy, such as wireless sensor nodes, active RFID and RTLS tags, consumer wireless remote controls or security systems. IEEE 802.15.4 - Low power radio frequency communication protocol. A standard which specifies the physical layer and media access control for low-rate wireless personal area networks. It is the basis for the ZigBee, WirelessHART, and MiWi specifications, each of which further attempts to offer a complete networking solution by developing the upper layers which are not covered by the standard. Alternatively, it can be used with 6LoWPAN and standard Internet protocols to build a Wireless Embedded Internet. In contrast with other, more end user-oriented approaches, such as Wi-Fi, the emphasis is on very low manufacturing and operation cost communication of nearby devices with little to no underlying infrastructure, intending to lower power consumption even more. IEEE 802.15.4g - Smart Utility Networks (SUN) Task Group is chartered to create a PHY amendment to 802.15.4 to provide a global standard that facilitates very large scale process control applications such as the utility smart-grid network capable of supporting large, geographically diverse networks with minimal infrastructure, with potentially millions of fixed endpoints. Recently news came up they released the 802.15.4g radio standard. On May 7, 2012, Elster (NYSE: ELT), Itron, Inc. (NASDAQ: ITRI), Landis+Gyr, the National Institute of Information and Communications Technology (NICT) of Japan, and Silver Spring Networks announced that IEEE released the 802.15.4g radio standard, a global wireless networking standard enabling interoperable communications between certain smart grid devices, including smart meters and smart home appliances. They say the new standard represents a huge leap forward in establishing common and consistent communication specifications for utilities deploying smart grid technologies. This standard, published on April 28, 2012 is an important fundamental standard for the large-scale networks that characterize the smart grid. The standard's baseline specifications for wireless communications will allow millions of devices to interoperate with each other in mesh, star, point-to-point, or any other topology. FFD – Full Functional Devices - Complex nodes that conform to the full 802.15.4 standard and can serve as routers. All devices can be implemented with low-cost, 8-bit microcontrollers (MCUs) that derive their power from two AAA batteries. Mesh Networking - A way to route data, voice and instructions between nodes. It allows for continuous connections and reconfiguration around broken or blocked paths by “hopping” from node to node until the destination is reached. A mesh network whose nodes are all connected to each other is a fully connected network. Mesh networks differ from other networks in that the component parts can all connect to each other via multiple hops, and they generally are not mobile. RFD – Reduced Function Devices - Sensors that communicate with full-function devices (FFDs). These are meant to be extremely simple devices with very modest resource and communication requirements; due to this, they can only communicate with FFD's and can never act as coordinators. ZigBee - A specification for a suite of high level communication protocols using small, low-power digital radios based on the IEEE 802.15.4 standard for wireless personal area networks such as wireless headphones connecting with cell phones via short-range radio. The technology defined by the ZigBee specification is intended to be simpler and less expensive than other WPANs, such as Bluetooth. ZigBee is targeted at radio-frequency (RF) applications that require a low data rate, long battery life, and secure networking. 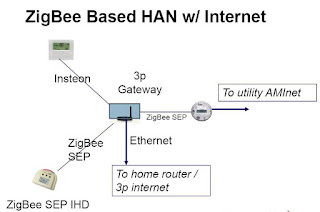 ZigBee IP - an Internet Protocol (IP) based stack specification called ZigBee IP was recently announced. ZigBee IP is being developed to meet requirements in the Smart Energy market. Like the ZigBee RF4CE stack specification, it is specific to a single application profile. 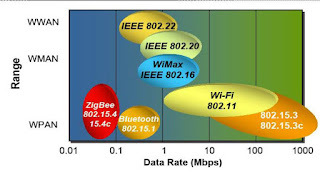 ZigBee RF4CE Specification - Based on IEEE 802.15.4. MAC/PHY radio technology in the 2.4GHz unlicensed frequency band and enables worldwide operation, low power consumption and instantaneous response time. It allows omni-directional and reliable two-way wireless communication, channel agility for enhanced co-existence with other 2.4GHz wireless technologies, simple secure set-up and configuration. Low Latency - Because Zigbee can activate (go from sleep to active mode) in 15 milliseconds or less, the latency can be very low and devices can be very responsive, particularly compared to Bluetooth wake-up delays, which are typically around three seconds. Long Battery Life - Because ZigBees can sleep most of the time, average power consumption can be very low, resulting in long battery life. Compatibility - Appliance and white good manufacturers want to be assured that the networking they insert into their products will be compatible with equipment coming out from other vendors. WiFi enjoys a broad and deep footprint: nearly every home with broadband has WiFi streaming through it already. And if a repairman wants to check on the health of a fridge, he can use an iPhone to pull information out of it; WiFi is standard on all modern smart phones. Central Point of Communications - The smart meter may not be a central point for communications into the home. Instead, homes may be equipped with a router that collects all of the data from a person's appliances and then feeds that data to the meter. This way, the meter, which only gets changed every few decades, can be insulated from technological and standards changes to some degree. The box will be the thing that has to be versatile and multilingual. And most people already have one of these boxes in their homes: it's called a DSL gateway. Communications Interference in Unlicensed Radio Spectrums - The Smart Grid provides mission-critical capabilities to the US economy and infrastructure. Communications is a key aspect of ensuring interoperability and increased efficiencies. Yet wireless Smart Grid device manufacturers and system integrators struggle with communication interference issues with other devices in unlicensed radio spectrums. Usage is not uniform across states further complicating the interoperability of networks. Range - Apartment complexes may not be a good for Zigbee communications Radio wave propagate through reinforced-concrete and metal materials used for housing structure which insulates floor vibration and sound. Sound-proof wall and heat insulator and plural number of doors are radio-wave insulators. Security - Encryption setting is crucial for wireless communication to avoid tapping. Bandwidth - ZigBee offers low bandwidth, but in home energy management applications that may work fine. Here's a sample of what the conversation will be inside a smart home. Meter: "Peak power prices hit. Turn down by 25 percent." Lamp: "OK." What low power wireless can NOT Do: broadband, telephone and video. Signal Strength - Devices that communicate wirelessly with their facility energy-management systems must broadcast powerful-enough signals, or other technical barriers to effective communication must be resolved. For example, a washer/dryer located in a house’s basement attempting to communicate with an energy-management system on the far side of the building will require a stronger signal than a closer device on the ground floor. Therefore communication equipment may need a flexible and dynamic range of broadcast strengths. Network Experience - Wireless carriers have network expertise, and a robust (and expanding) footprint of “broadband to the person.” Use of existing networks is an efficient and sustainable way to leverage existing infrastructure and minimize deployment costs. Smart Phones - Consumers can monitor and adjust usage anywhere with Smartphones. Reliability - Utilities can detect outages and establish real-time demand response solutions through wireless platforms. Determine the need for dedicated spectrum – NIST plans to commission a group of experts to study the issue of communications interference in unlicensed radio spectrums for smart grid applications and develop business and technical requirements on the optimal requirements for wireless spectrum usage for Smart Grid communications. The objective is to produce the necessary arguments to identify the preferred usage of spectrum throughout North America. Reasonable network management principles should recognize (as FCC Chairman Genachowski does) that “wireless is different” and has unique network congestion concerns. AeroScout - Redwood City, CA - The market leader in Unified Asset Visibility (UAV). AeroScout solutions use Wi-Fi-based Active RFID, sensors, RTLS and other technologies to provide complete wireless asset tracking and monitoring. Their solution enables the location tracking of assets and provide automated condition monitoring and sensing of critical assets and devices in the energy and utilities industries. Uses Wi-Fi-based Active RFID to provide wireless asset tracking and monitoring in various verticals including healthcare, manufacturing and logistics. Cisco Systems is a strategic investor who has established a close relationship with AeroScout and could be viewing the company as a potential acquisition target. Arcadian Networks - Valhalla, NY - A startup that owns licensed 700-megahertz spectrum across a swath of the American heartland and is selling smart grid services to utilities, has jumped into the WiMAX smart grid market with its new AE20r gateway deviceProvides “last mile” wireless carrier services to the energy sector (electric, water, and gas utilities and oil and gas companies). The company’s 700 MHz licensed spectrum delivers a converged IP network with voice and data communications for fixed and mobile applications. Received $90 million in venture capital funding in 2008. Arcadian says the 700MHz spectrum is a better choice than 900Mhz in rural areas, since the signal can travel farther without relays and can penetrate physical obstacles (such as crops and hilly terrain) that higher frequencies may struggle with. And since the 700MHz spectrum is licensed -- there is no interference from other sources. Arcadian has helped deploy a 66,000 square mile network for Great River Energy in Minnesota that operates 24/7, 365 days a year. There are 2,000 applications and 67 base stations hooked up to the network. Arcadian has connected disparate advanced metering infrastructures across the territory. CISCO - San Jose, CA - Purchased Arch Rock in September 2010. With the acquisition of Arch Rock, Cisco will now own a wireless mesh network technology product that can connect smart meters to utilities’ control stations and could link up to its other building automation services, its box for home energy management and its smart grid substation gear. Arch Rock was a pioneer in IP-based wireless sensor network technology and provided products that bridge the physical and digital worlds, extending IP to Low-Power, Wireless Personal Area Networks. Eka Systems, Inc Germantown, PA - Developed its own smart meter data communications and networking technology called EkaNet Smart Network an advanced metering intelligence solution that allows two-way energy data communication between utilities and their customers. The company raised $18.5 million in expansion capital last year and have expanded their management team with a possible view to an IPO. Says that companies like Silver Spring Networks that have built IP networking systems are settling on a standard that, while open, will lead to problems with increasingly complex data communications needs to come in the future. Ember - Boston, Mass - Zigbee compliant chip manufacturer. Gainspan - Los Gatos, CA - Spun out of Intel. GainSpan brings Ultra-low-power Wi-Fi to sensors and embedded applications. The company's semiconductor solutions break new ground in Wi-Fi applications by enabling years of battery life for Wi-Fi sensors and other devices. Gainspan is promoting WiFi for appliance communication. On September 30, Gainspan announced it is partnering with RF module maker RF Digital and home energy management application startup Our Home Spaces under the umbrella of the U-SNAP Alliance to make a kit for homeowners to measure and control energy consumption. GridNet, San Francisco, Founded by Ray Bell, a former Cisco exec and one-time interim CEO of Silver Spring. Network GridNet develops software for connecting utilities, regional power stations and homes. It wants utilities to turn to the long range, high-bandwidth wireless data protocol WiMax instead. GridNet says the growing WiMax network being put in place by Sprint and Clearwire, with billions in investments from the likes of Google, Comcast, and Time Warner Cable, would be a ready-made communications system for a future smart grid. GridNet is a leading provider of policy-based network management system (NMS) software for the utility Smart Grid, PolicyNet Smart Grid NMS™ software, of which core components are based on the Common Open Policy Service (COPS) engine. In 2009, GridNet signed a deal with Australian utility SP AusNet. The utility plans to use the next-generation wireless technology to link about 680,000 household customers with smart meters. The company raised $7.7 million in 2008 and $13.8 million in 2009. In March 2010, Cisco made an equity investment for an undisclosed amount in Grid Net. Other investors include Intel, one of the early and persistent promoters of WiMax, and General Electric. General Electric also licenses the company's technology for some of its meters. The big debate surrounding Grid Net is whether or not utilities really need this kind of bandwidth. Smart homes will send persistent amounts of data, but in relatively low amounts compared to that used by computers. Rival Silver Spring Networks has been winning contracts in the U.S. by selling mesh networking equipment. Motorola - Schaumburg, IL- Developing WiMax router with all the extras stripped out. The CAP 36320 is based around the 802.16e protocol, the same one used in WiMax equipment. But unlike WiMax equipment made for telecom companies, Motorola's router won't support things like roaming capabilities. Power meters don't move around, after all. By stripping out the telecom nuances, utilities can reduce the amount of back-end equipment to run a network. On-Ramp Wireless - San Diego, CA - Provides a wireless communication system comprised of one or more Access Points with the capacity to communicate bi-directionally with thousands of wireless modules (eNodes); all designed to easily integrate with a variety of third-party product platforms. The system utilizes On-Ramp’s secure, low-power Ultra-Link Processing™ (ULP) technology to achieve range and coverage far beyond existing systems for metro-scale deployments and other challenging wireless environments. In June, 2012, On-Ramp raised $10.1 million of a planned $30 million round from Energy Technology Ventures, the joint venture of General Electric, NRG Energy and ConocoPhillips, bringing its total raised to date to about $47 million. On-Ramp claims a single Access Point can replace several hundred mesh gateways used in competing systems, resulting in lower upfront capital cost and a simpler, more reliable network. With its industry leading metro-scale and campus wide deployment capabilities, the ULP system enables monitoring and control in a host of new applications with substantially lower Total Cost of Ownership compared to competing solutions. In August 2012, On-Ramp announced that a DOE-funded pilot shows its technology can network lots of underground grid assets, and that this in turn can help improve a key utility outage metric: System Average Interruption Duration Index, or SAIDI. RuggedCom - Concord, Ontario- An industrial networking firm that is teaming with smart grid firm Current Group to jointly deliver integrated smart grid infrastructure and advanced applications for distribution automation. Tantalus Systems Corp., Burnaby, BC, A market leader in two-way, real-time smart grid data communications. With more than one million meters under contract, it is the leader in co-op and municipal utilities. Tantalus' wireless communications technology (TUNet - the Tantalus Utility Network) is designed to provide utilities with greater control over their power grid by automating processes like outage detection, load forecasting, billing and reporting, demand response, and maintenance. On January 20, 2010, Tantalus announced that is has raised $14 million in equity to fund its ongoing penetration of energy efficiency solutions into co-op and municipal utilities. The financing was led by Redpoint Ventures and included several current investors in the company. Great and amazing article.I gives me to know about speedy internet and ideal information.